Another Meserve hybrid holly - this one is a female clone that is an abundant berry producer with large berries measuring about 1/3" in diameter. Good lustrous, glossy green foliage which often times has a tendency to "cup" somewhat. Grows in much the same fashion as its pollinating counterpart, China Boy Holly - somewhat rounded, mounding habit. Excellent heat & cold tolerance. Prefers full sun, but will accept some shade as well. Likes well drained soil. Very easilt trimmed / pruned to maintain just about any shape or size. 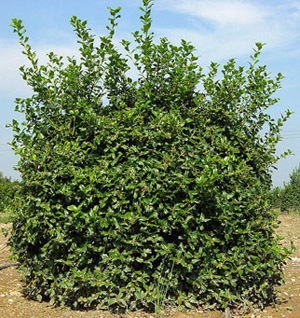 Commonly used in hedge plantings along with China Boy, or in group plantings as well.